Many coworkers may recognize the the name “Studer,” as in Quint Studer. It was our work with the Studer Group that has played a significant role in our company-leading improvement in coworker engagement and physician satisfaction scores. What many coworkers may not know, is that now Quint Studer has turned his experience, knowledge and insight into helping revitalize small to medium-sized communities…communities exactly like Hot Springs, Arkansas. 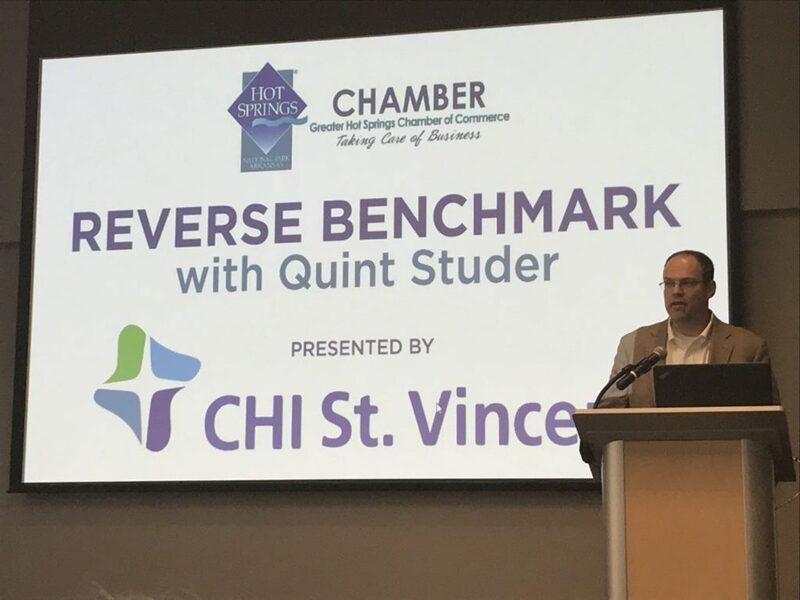 Hot Springs sponsored a presentation from Quint Studer to the Hot Springs Chamber of Commerce in support of their quest to take their downtown area to the next level. As part of that sponsorship, Hot Springs leaders were treated to an impromptu talk from Quint. His energy, insight, knowledge and humorous anecdotes inspired the room. What a blessing to get to spend an hour with him.